It's Green Garlic Season: Celebrate with Pesto! Every year, usually around the beginning of February, I notice that the ornamental plum trees in Golden Gate Park are starting to burst into clouds of pink and white, covering the lawns with a pale, fluffy blanket of springtime splendor. But as much as I love how these 10-foot tall pastel bouquets line the streets, my mind instantly goes to another sign that the season is changing. Soon local farmers markets vendors will start stocking my very favorite bit of produce, which is only found this time of year: green garlic. For those not in the know, green garlic is simply early season garlic that hasn't yet matured into a fully bulbous state. Green garlic is special for many reasons, but the reason I love it so is that it takes the strong, pungent qualities of mature garlic and lightens up the game a bit. Infinitely more subtle and nuanced than its full-grown brothers and sisters, green garlic has a less intense flavor and a sweetness that only early-season produce can impart. Perfect for both strong and mellow dishes, green garlic can be used wherever you would use regular garlic, in the same amounts. Give it a try in garlic bread or mashed potatoes. As well, green garlic's flavor is gentle enough that it can be eaten raw in a lovely green salad. Seriously! Perhaps the coolest thing about green garlic, though, is the fact that you can eat the entire thing, from it's long, frondy leaves to it tiny root system. The younger the garlic the more tender it will be, and you'll know true baby garlic by its nearly complete lack of a bulgy, bulb-y end. As the season progresses week by week, you'll notice that green garlic at your local farmers market will get thicker and thicker towards the bulb-end, until it looks almost like a fully matured bulb of garlic with a long, green stalk. At this point you can still eat the entire thing, though the fibrous membrane that separates the individual cloves will have begun to form by this stage in its development. 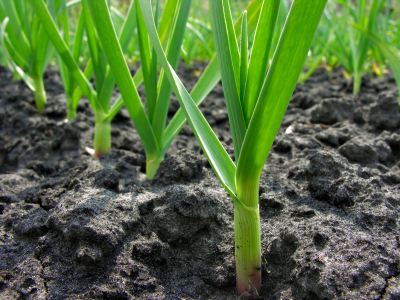 The cloves will have a strong, more traditional garlic flavor as they mature as well. When shopping for green garlic, look for specimens that are long and green, without any browning or wilting along the stalk. Green garlic should be eaten within a week of being harvested for the best possible flavor, though it can be stored in the refrigerator for up to three weeks if you end up with a bunch of it. To store young garlic, I'd recommend wrapping the stalks in foil and leaving them in the crisper drawer of your refrigerator, where the humidity will work to keep them fresher, longer. If you're not planning on eating them right away, a little spritz of water in the foil every few days will help keep green garlic tender and fresh. The best way to enjoy green garlic is in a dish where it's the star. For anything even remotely herb-y, I always try it out in a pesto recipe, where its flavor is front and center -- and in this case, green garlic plays the lead role with aplomb. 1. To the carafe of a food processor, add green garlic, parmesan, pine nuts, sea salt and pepper. Pulse 10-15 times, until ingredients are relatively well-blended, scraping down the sides in the middle of blending. Slowly drizzle in olive oil and continue blending until you get a well-combined pesto texture. Scoop into a bowl and set aside while the pasta cooks to let the flavors meld. 2. Add kosher salt to water and bring to a boil in a large pot. Add pasta and cook until al dente, about 9 minutes. Drain and rinse pasta. 3. Spoon pesto over hot penne pasta and serve immediately.